In a product line-up of unnecessarily long names, the 2017 BMW X1 xDrive25Le iPerformance has taken the crown. Released specifically for the Chinese market, this new plugin hybrid boasts the same drivetrain as seen on the 2 Series Active Tourer plugin with similar performance figures. The highlights here are a 60 km electric only range with a total fuel consumption of 1.8L per 100 km. 0-62 arrives at 7.4 seconds with the two motors working in tandem. The BMW X1 xDrive25Le iPerformance likely is foreshadows two similar products for the US market. First will be the MINI Countryman E and then (not yet confirmed) another X1 hybrid with identical specifications. The latter has been rumored for some time and is likely to join the US line-up within the next 18 months. 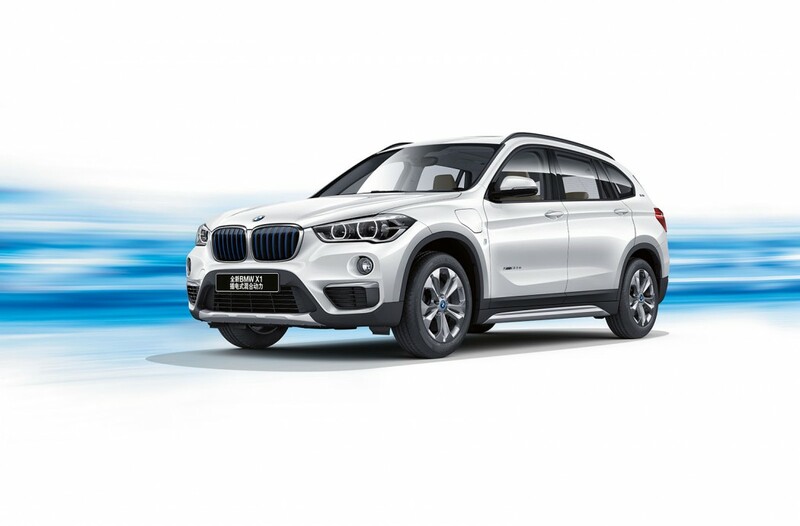 Official Release: The new BMW X1 xDrive25Le iPerformance has been unveiled to the world at the Chengdu Motor Show 2016 as the latest addition to BMW’s family of new energy vehicles (NEVs) and the first plug-in hybrid in the compact luxury SUV segment. Manufactured by BMW Brilliance, the new model combines driving pleasure with cleanliness and environmental protection in addition to luxury and quality. Moreover, it is fully in line with China’s development policy for the NEV industry. All these underline BMW Group’s production and R&D capabilities for sustainability in China and the Group’s dedication to leading the way in the NEV market. The new BMW X1 xDrive25Le iPerformance was developed simultaneously with the new BMW X1 Series launched some time ago. Riding on the powerful, ground-breaking product strengths of the X1, it borrows the innovative eDrive technology from the BMW i line-up to provide unique electric driving pleasure, offering BMW fans yet another choice for green travel. Electric drive performance and sheer driving pleasure. Throughout its more than a century of innovation, BMW Group has stayed true to its brand essence of providing sheer driving pleasure, no matter how technology changes. The X1 xDrive25Le iPerformance runs on both electricity and fuel, with the petrol engine and electric motor powering the front and rear wheels, respectively, with the intelligent energy management system taking care of on-demand power response and energy efficiency maximisation. This design, inspired precisely by the BMW i8 that has been hailed as a future warrior, reflects BMW Group’s strategy of applying the revolutionary innovations of the BMW i line-up to other series-produced models by the BMW brand. With BMW’s latest turbocharger technology, the 1.5-litre petrol engine at the front axle is mated to a six-speed integrated manual/automatic gearbox and churns out a maximum power output of 100 kW with peak torque clocking in at 220 Nm. The electric motor at the rear axle, on the other hand, produces power up to 70 kW and can instantaneously deliver a peak torque of 165 Nm at start-up. Thanks to BMW’s proprietary eBoost function, both power systems can provide a peak torque of 385 Nm allowing acceleration from stationary positions to 100 km/h in just 7.4 seconds with a combined fuel consumption as low as 1.8 litres per 100 km. Plus, BMW’s xDrive technology ensures supreme traction and safe driving in all weather and road conditions while at the same time enhancing stability during emergency lane changes or cornering. No matter which type of energy is used, xDrive optimises the driving dynamics and provides an optimal ride feel. The X1 xDrive25Le iPerformance system comes packed with a high-voltage lithium battery with a net capacity of 10.7 kWh to provide a purely electric cruising range of 60 km and a combined cruising range of 630 km when working in tandem with the 35‑litre fuel tank. It delivers low emission and fuel consumption to meet the needs for driving in any situation, whether in the city, the suburbs or for driving long distances. BMW’s eDrive technology offers three modes for controlling the energy source, all at the simple touch of a button: The driver can enjoy sheer driving pleasure – just like driving any other BMW – by safely leaving everything to the default Auto eDrive mode, which intelligently selects either a single or a combination of energy sources to maximise the combined energy efficiency with ease. For example, electric drive is initiated at speeds of 80 km/h or below, whether you are cruising at a constant speed or accelerating slightly. However, at any time you step hard on the accelerator or when the speed exceeds 80 km/h, the system activates the petrol engine automatically, letting both power systems work in tandem with each other to supply ample power and deliver the superior driving performance expected by the driver. In Max eDrive mode, the car runs purely on electricity with zero emissions at speeds up to 120 km/h and minimises the burden on the environment – especially in urban traffic jams. When expecting to run into a traffic jam, the driver can turn on the Save Battery mode to save the battery capacity for later zero-emission, purely electric driving. As with all other X1 models, the X1 xDrive25Le iPerformance comes with BMW’s Driving Experience Control, offering Sport, Comfort and ECO PRO. The Sport mode is performance-oriented and brings an even better response from both the accelerator pedal and the engine. ECO PRO, on the other hand, takes energy efficiency as a priority and results in a relatively mild power response and reduced power consumption of in-car electrical equipment such as air-cons. Also, the Comfort mode strikes an optimal balance between comfort and energy efficiency. It is worth mentioning that BMW’s Driving Experience Control can work together with the eDrive energy management system to provide customers with richer driving pleasure. Intelligent energy management, electrical energy priority and fuel efficiency. The only way to minimise fuel consumption and exhaust emissions is to prioritise the use of electricity drawn from the grid. With a 220V / 16A charging wall-box, the high-voltage lithium battery of the X1 xDrive25Le iPerformance can be fully charged in 3.7 hours and charged to 80% in just 2.9 hours. BMW has not only given the drive system a full overhaul, but also the design of the car has been reinvented. The car air-con utilises an electrically driven compressor powered by a high-voltage battery, while the energy consumption of other in-car electrical systems also comes from the energy stored in the battery. Another important principle of the intelligent energy management system is adequately improving fuel efficiency by keeping the engine running as much as possible at rotational speeds within the efficiency range during start-up. For this reason, the system determines when the electric drive system needs to supply additional power based on the energy output from the engine. Conversely, as a way to optimise the overall energy consumption of the system, some of the engine’s power output gets converted into electrical energy where appropriate – depending on the battery status and driving needs and then stored in the battery. The high-voltage lithium battery pack of the new X1 xDrive25Le iPerformance, being placed in the middle of the chassis, sits at an optimally safe position of the car, proven to provide safety protection based on crash tests from the front, side and rear. With the charging and discharging occurring within an optimal capacity range and the use of a liquid cooling system, the battery always maintains an appropriate operating temperature, bringing benefits to its performance as well as prolonging service life. Intuitive and user-friendly human machine interfaces allow more proficient involvement of the driver in energy management. Efficiencytainment, BMW’s unique energy efficiency display system, has all energy consumption information covered. The energy flow status gets displayed in real-time on the central screen as dynamic red and blue arrows or icons. Besides that, there are also indicators on the dashboard for the cruising range, charging status, energy consumption and other relevant information which is presented in an easy to understand manner to help the driver develop greener driving habits. Luxury and comfort with ground-breaking configurations. Based on the design aesthetics of the new BMW X1, the new BMW X1 xDrive25Le iPerformance highlights quintessential, recognisable elements of the NEV family: double-kidney air inlet grille in blue high-gloss, BMW i logo under the charge port and the C-pillar, door scuff and gear lever emblazoned with marks indicating the use of eDrive technology. The new BMW X1 xDrive25Le iPerformance is available as Cross Country and Sport packages, offering up to 10 body colour choices, allowing car owners to show a bit of their personality with a rich variety of options. Due to the electric drive system designed to sit entirely under the frame, there is almost no compromise on the interiors. As with the new X1, the X1 xDrive25Le iPerformance has a wheelbase of 2.78 m, comes with a large panoramic sunroof allowing more natural sunlight to enter and boasts the most spacious and comfortable interior among its class. Sporty seats at the front offer raised comfort and support, while the rear seats slide fore and aft up to 13 centimetres. Folding down the 40:20:40 rear seat backrest allows boot capacity to vary between 445 and 1,550 litres. Electrically-powered boot opening also makes operation extremely convenient. The car also comes with Park Assist, a system which is undoubtedly very helpful in modern cities. This system automatically detects suitable parking spaces and helps you park with ease. All the driver needs to do is to change gear and control the brake pedal as prompted while parking (curbside). Also, the zoned automatic air-con has a highly efficient micro-filter capable of removing fine particulates (PM2.5) with a filtration efficiency of 99%. Other extremely practical configurations include a rear-view mirror assembly integrated with electric folding, heating, parking assist and memory functions, an electronic handbrake and run-flat tyres. ConnectedDrive – convenient and in control. In addition, the X1 xDrive25Le iPerformance comes standardly equipped with basic BMW ConnectedDrive services, which are free for ten years. BMW ConnectedDrive has always maintained a leading position in the industry. Other than leading with continuous technological innovations, the rich content, easy operation logic, professional services and a sound system round out its immense advantages. The basic services cover Teleservices and Emergency Call. Customers may also add on optional premium value-added services such as Enhanced ConnectedDrive, Concierge Services and Real Time Traffic Information. With advanced BMW ConnectedDrive technology, the X1 xDrive25Le iPerformance also comes with some unique convenient functions. You can use the My BMW Remote app to turn on the air-con remotely, allowing you to enjoy a comfortable ambient temperature the moment you step into your car. The air-con runs on power supplied from the high-voltage battery and does not affect the purely electric cruising range even when connected to the charging wall-box for charging. You can also use the My BMW Remote app to view the status of your car, energy efficiency data as well as set driving routes through your smartphone. The navigation system based on BMW ConnectedDrive also includes information on public charging stations, making it easy for the driver to find available charging piles anytime. 360° ELECTRIC – comprehensive premium services for electric travels. BMW Group has especially come up with a 360° ELECTRIC programme to provide comprehensive services for electric travels. First of all, home charging. A charging wall-box and basic installation service will be provided for free to customers living in areas where there is an authorised X1 xDrive25Le iPerformance dealer. Secondly, semi-public community charging services. For customers without fixed parking lots, BMW offers semi-public shared charging services within communities and a charging card package allowing customers to enjoy two years or 1,920 hours of free services. Thirdly, public charging. With ChargeNowTM, BMW Group partners with a third party to build public charging infrastructures. The number of charging piles is set to reach 1,500 this year. Fourthly, worry-free services. The high-voltage lithium battery pack of the X1 xDrive25Le iPerformance comes with warranty services for eight years or 120,000 km, leaving you worry-free when it comes to battery durability. Localisation commitment and trailblazing. The new BMW X1 xDrive25Le iPerformance is an important component of BMW Brilliance’s strategy for NEVs. BMW Brilliance has always been at the forefront of the industry when it comes to the development of NEVs in China. Our unrelenting efforts in developing energy-saving models and protecting the environment have made us the most sustainable and respected premium car manufacturer in China. BMW firmly believes that innovation and sustainability will define luxury in the future. Electric travel will be a sustainable mode of transportation for a very long way ahead. With sustainability at the heart of our strategy, BMW Brilliance is leading the way and actively exploring the future. The BMW X1 xDrive25Le iPerformance will only be available in China.